An early look at Comdex setup makes us think that security will be a top priority this year, as indicated by this no-nonsense sign at the entrance to the LVCC Gold parking lot. 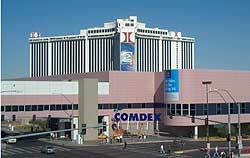 The newly erected Comdex sign in front of Las Vegas Convention Center extends a bold welcome to techies and business execs alike to visit Comdex and enjoy the sunny and cool Las Vegas weather. 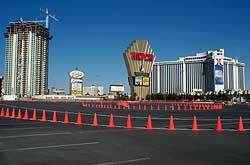 This is prime time for visiting southern Nevada and there are deals for rooms and entertainment throughout the city. Tech visitors may have to look a bit harder during Comdex, but their are always some bargains waiting to be discovered. 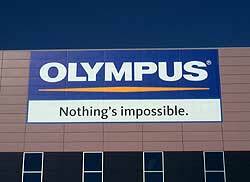 Olympus boldly states "Nothing's Impossible" on their sign displayed on the Las Vegas Convention Center. Read our review of their fine 3000 family of digital cameras. It will be interesting to see how Olympus continues its business push into the technical marketplace at this year's event. 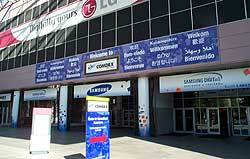 Comdex is a major international event as graphically seen by the multi-lingual signs. Sunday, the global business forum promises to offer some new insights on how to work effectively in these challenging economic times. The huge Intel P4 banner on the Hilton Hotel immediately caught my attention. 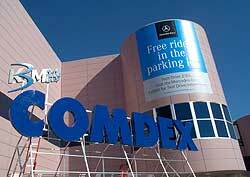 This confirmed to us that Comdex was planning to put on "a big business with a purpose" face, in spite of terrorist implications and a significant business downturn. Traffic throughout the city is notably down but Comdex is getting ready for business. The Intel banner covers one side of the Las Vegas Hilton in the distance. The popular Mercedes Benz "ride and drive" is in the LVCC Gold lot and is ready for some serious short, but intense, drives by Comdex attendees. If the experience this year is anything like 2000, the impressions will be very positive and long lasting. Glad to see Mercedes is back! The Mercedes Benz road course features day glow cones, short acceleration straights and some hard tight turns. This course will provide a good test of Mercedes handling characteristics in the real, physical world. Intel with their P4 "engine", will provide a different type of test drive in a virtual world at their booth inside the Las Vegas Convention Center (LVCC). The stylish Mercedes tent, with flowing lines, contrasts nicely with the straight lines of the Las Vegas Hilton and the Intel P4 banner. Ladies and Gentlemen -- start your engines. The Marriott Hotel on Convention Center Drive is serving as the Microsoft Operations Center and press headquarters. 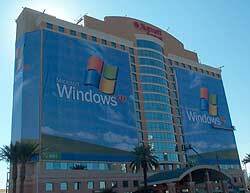 Being almost completely covered by several massive Microsoft XP "see-through" banners, I was surprised to see such a radical transformation of a building. Several passersbys exclaimed, "Wow, look at that!" and "What is Microsoft up to now?" Comdex is always full of surprises and one set-up worker said "I'm glad to see another big show come into town after 9/11. We all need the money and believe me, those big Microsoft banners are expensive to make. We earn a fair bit to install them". As he walked away, he said " If they can think up these wild displays, we can install them ontime". Copyright © 2001 Jim Bennett and Rick Smith All rights reserved.